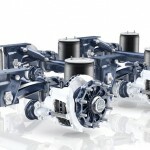 BPW is Europe’s leading manufacturer of trailer axle and suspension systems. It has been producing axles for over 100 tears and is renowned for quality. We carry a large range of genuine BPW parts in stock.